Vickie Williams of OPN-Door Communications has been certified by the Supreme Court of Virginia to facilitate this workshop. This workshop, which meets the parent education guidelines developed by the Supreme Court of Virginia, will help you focus on healthy ways to parent from separate households - while keeping children out of the middle of custody, visitation, child support or divorce negotiations. This parenting class offered by OPN-Door Communications uses handouts, videos and group discussions to help you navigate co-parenting. Parents will receive a certificate upon completion of the class. Fulfills the requirements of the Virginia Code requiring divorcing/separated parents with minor or in a disputed custody case with minor children to attend a co-parent education seminar before their court appearance. $45.00 fee if registered and paid in advance. $50.00 fee if registered and paid on the day of class. 10:00 am until 2:00 pm. 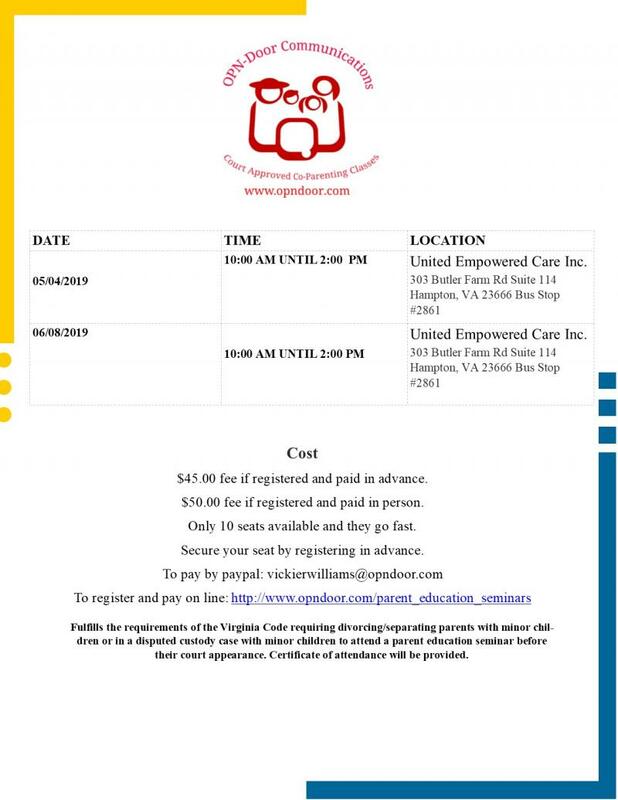 Location: United Empowered Care Inc. 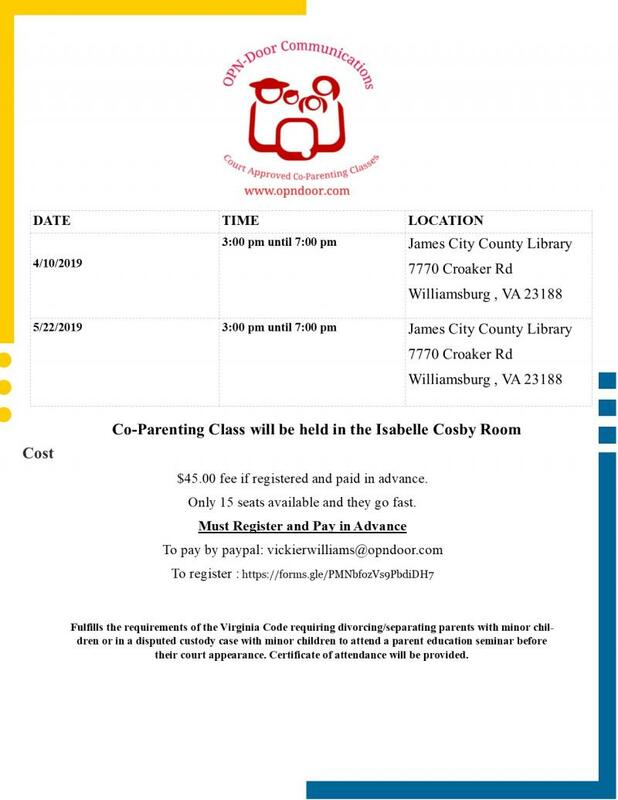 I am excited to offer a Co-Parenting Class in Williamsburg. 3:00 pm until 7:00 pm . Co-Parent Educations Seminars will be held in Portsmouth by appointment only. They are only offered on Monday or Tuesday. To attend Portsmouth Seminars, you MUST pay in advance. Call 757-816-4478 for appointment. This session will last 4 hours. You must remain for the entire period to receive a certificate of attendance.